Coconut oil and cholesterol: Is coconut oil good for your heart? Home » Heart Health » Cholesterol » Coconut oil and cholesterol: Is coconut oil good for your heart? Coconut oil is one of the latest health trends in regards to skincare, haircare, and your diet. While some sing this oil’s praises and claim it has many health benefits, others have raised concern over its high levels of saturated fat, which can play a role in elevating cholesterol. So, is coconut oil really good for you, or do the cons outweigh the pros? Continue reading to find out! Coconut oil is created by pressing the fat from the meat of the nut—the white inner layer. Approximately 84 percent of the calories that come from coconut oil are made up of saturated fat. In comparison, 14 percent of calories from olive oil are attributed to saturated fat, and so are 63 percent of butter. However, the saturated fat found in coconut oil is made up of medium-chain triglycerides that some suggest your body processes better than other saturated fats, like the ones found in dairy and fatty meats. Along with saturated fat, coconut oil also contains 0.8 grams of monounsaturated fat and 0.2 grams of polyunsaturated fat per tablespoon, making it a source of good fat too. While its saturated fats may not be as bad as others, can the high percentage of calories attributed to these medium-chain triglycerides really help lower cholesterol? Some studies have shown that adding coconut oil to your diet can help boost your HDL cholesterol—known as the good cholesterol—making it better for heart health than other oils. However, it has also been found to raise LDL or bad cholesterol—the kind that causes plaque buildup in your arteries. In essence, coconut oil may have a neutral effect on heart health as it seems to raise both good and bad cholesterol, so no, it does not actively lower your cholesterol levels, though it does help promote HDL production. Saturated fats like the ones found in fatty meats, butter, cheese and other dairy products can raise your LDL cholesterol level and, in turn, increase your risk of heart disease. The American Heart Association recommends limiting your consumption of saturated fats to prevent the buildup of LDL within your arteries, which could ultimately lead to a heart attack. Try alternative cooking methods or purchasing leaner cuts of meat to reduce your intake of these harmful fats. 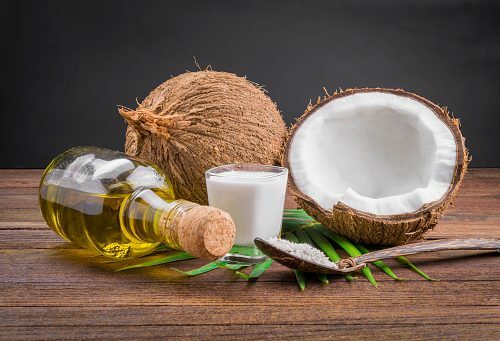 While coconut oil is high in saturated fats, these fats are made up of medium-chain triglycerides, which are better processed by the body, suggesting that it is a healthier alternative to other sources of saturated fat like butter and vegetable oils. Coconut oil has been found to have a mostly neutral effect on cholesterol, raising both good and bad levels, meaning that it does not lower cholesterol but does provide the benefit of promoting HDL production. As recommended by the American Heart Association, limiting your intake of saturated fats is the best course of action, though these facts suggest that replacing butter with coconut oil when cooking may be the healthier option.